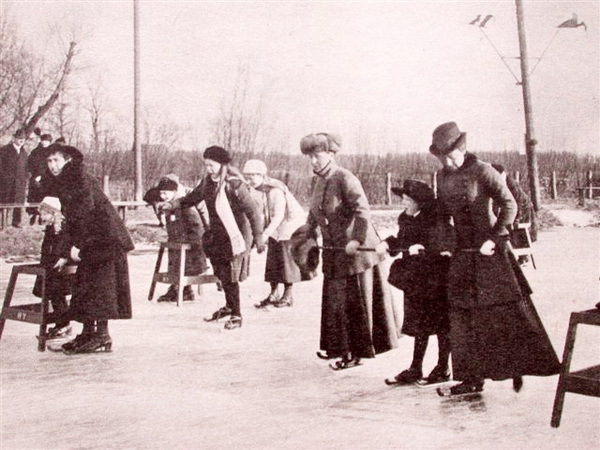 Queennies (from 'the queen's ice skates') were just traditional Friesland speed skates with medium high tips and extended runner blades. They have brass foot and heel plates and luxurious straps with three buckles. They were designed around 1890 and present the top of the Friesland model. The intention of the designers was to make the ultimate speed skate, but unfortunately the serious speed skaters judged them as too heavy. So, they were sold as top touring skates. When HM Queen Wilhelmina bought a pair for herself and afterwards an additional pair for Princess Juliana the manufacturer used this in a commercial way by calling this model from then on Queennies. The designer was a mr. Vissering and therefore the initials of both the designer (V) and the manufacturer (R) were brand marked in the wooden platform. The above picture was made December 1916, at the The Hague Ice Club. At the right we see the then seven years old Princess Juliana at the rod between HM Queen Wilhelmina and a lady-in-waiting. This is the model as originally made by Firma G.S. Ruiter, Akkrum. Queennies have been produced over the years. They have been imitated by several other manufacturers. For example by the factory of J. Nooitgedagt & Zn, IJlst. at around 1960 and have stylized tips in the form of a wooden curl.